Mostly ground floor. Four bedrooms: 1 x first floor double with en-suite shower, basin and WC, 2 x double, 1 x twin. Bathroom with bath, shower over, basin and WC. Kitchen with dining area. Utility. Sitting room with solid fuel stove. 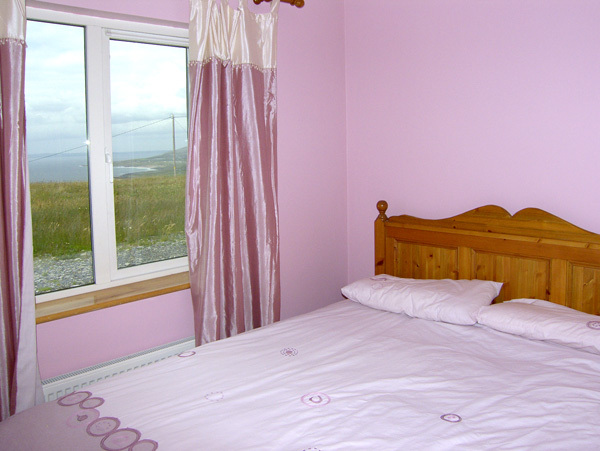 Kittys Cottage is a wonderful family holiday home, situated near the coastal town of Portmagee on the Iveragh Peninsula in County Kerry. The cottage is detached and bright, with four bedrooms accommodating up to eight people, including two double bedrooms and a twin room on the ground floor, plus a double bedroom upstairs with an en-suite shower room. There is also a family bathroom downstairs, a kitchen with a dining area, plus a sitting room with a solid-fuel stove. Outside, there is off road parking, a lawned garden to the front and a patio with furniture, a barbecue and views to Valentia Island. Set on the Wild Atlantic Way and near the Ring of Kerry, Kitty’s Cottage is a wonderful base for exploring this area of Ireland. Oil central heating with solid fuel stove. Electric oven and hob, microwave, fridge/freezer, washing machine, tumble dryer, dishwasher, TV with Saorview, WiFi, selection of books. Fuel, power and starter pack for stove inc. in rent Apr-Sep inclusive. €30 supplement for fuel and power to be paid directly to owner Oct – Mar inclusive. Bed linen and towels inc. in rent. Cot and highchair on request. Ample off road parking. Front lawned garden, plus patio with furniture and BBQ to rear. One well-behaved dog welcome. Sorry, no smoking. Shop and pub 1.5 miles.